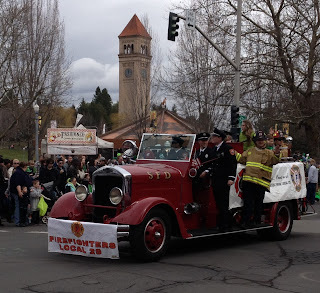 On Saturday March 23, 2013 at 11:39 AM, 6 Companies of Spokane Firefighters, 4 Engines, 1 Heavy Rescue and 1 Senior Ladder under the direction of Battalion Chiefs Cornelius and Donahoe responded to a reported residential fire a 2914 East 17th Avenue on Spokane’s South Hill. The first company (Engine 7) arrived within four minutes and reported a two story residence with heavy smoke showing from the eaves of the home. While completing a walk-around of the building, Engine 7’s officer immediately identified a patient that was suffering from smoke inhalation. The patient was moved to a safe location to awaiting SFD Paramedics and treated for serious injuries. As Engine 7 prepared for an offensive attack with their three personnel, additional companies secured a water supply from a nearby hydrant and backed up the interior companies on the offensive attack. Due to the rapid progression of the fire, the incident was upgraded to a working fire and added an additional Senior Ladder, AMR Ambulance and AMR Supervisor. The first arriving Ladder Company used ground ladders to access the roof and cut ventilation holes directly above the fire on the second floor. Later arriving companies successfully searched the entire structure for victims as well as establishing a rapid intervention team for the safety of the firefighters assigned to the incident. It took 24 Firefighters just 25 minutes to locate and knock down the fire and control the incident. There was one civilian injury (adult male) which was transported to Sacred Heart. The cause is under investigation by the SFD SIU and Spokane Police Department. Firefighters were able to contain the damage to the second floor and prevent the fire from spreading. The Red Cross is assisting the occupants (renters) and the home will not be immediately tenable. Burn is coming to Spokane! BURN - Official Theatrical Trailer (2012) from BURN on Vimeo. AMC River Park Square 20 7:30pm Buy tickets Admission: $15 online, $20 at the door. Address: 808 W Main Ave . Screening supported by The Washington State Council of Fire Fighters. Also supported by locals 2916, 29, 876, and 3711. CLICK HERE to download a flyer to print, email, and/or hang in firehouses! You can preorder tickets here.